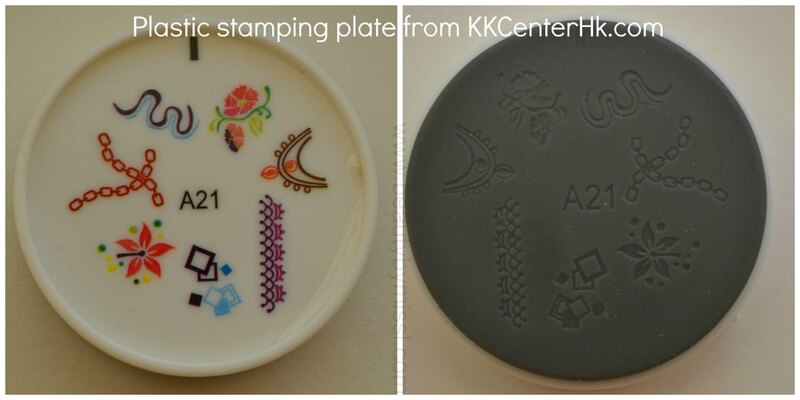 You are here: Home / beauty / NOTD: Plastic stamping plate from KKCenterHk. NOTD: Plastic stamping plate from KKCenterHk. For my today´s manicure I did some stamping with plastic stamping plate. When I first saw them on KKCenterHk website I wasn´t very sure how easy or difficult stamping with something like that would be and it did seem kind of messy. Using plastic stamping plate is different from the regular stamping plates because you do not need scraper or stamper. You just apply your nail polish on the image you want to transfer on your nail. Then put the stamping plate on the paper and drag it to remove any excess polish and if you are done then stamp the image on your nail (I think I should do a video tutorial about this). It is really simple, but just takes some practice to get the perfect result. Mine isn´t that perfect, but unfortunately I didn´t have time to re-do my nails. I used China Glaze Velvet Bow (seen HERE) as a base for this manicure and as you can see I wasn´t able to completely remove it from my cuticles :S (the only downside this polish has). For stamping I used OPI Alpine Snow.